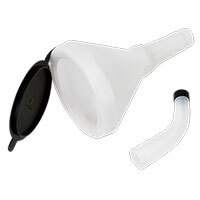 A handy essential for both home garages and professional workshops, everyone needs a car fuel funnel at their disposal. Tough and highly resistant to both fuel and other chemicals, you'll find a wide selection online at Euro Car Parts. Need to transfer fuel from a fuel can in your garage to a more portable alternative, so you can take extra on the road with you? You'll need a car fuel funnel. This handy little tool makes transporting liquid from one container into another easy - car fuel funnels are even ideal for topping up your vehicle's fuel supplies directly. Of course, car fuel funnels can be used for more than just fuel - they're perfect for transferring almost any kind of liquid. High quality and resistant to fuel and various other chemicals, they won't corrode - no matter how many times you use them. Take a look at the range of car fuel funnels at Euro Car Parts above. Not only do we offer different sizes, we also have funnels with or without handles. Simply choose what's right for your needs. If you require any assistance when browsing our site, don't hesitate to get in touch with our car experts at Euro Car Parts. We're always happy to help!